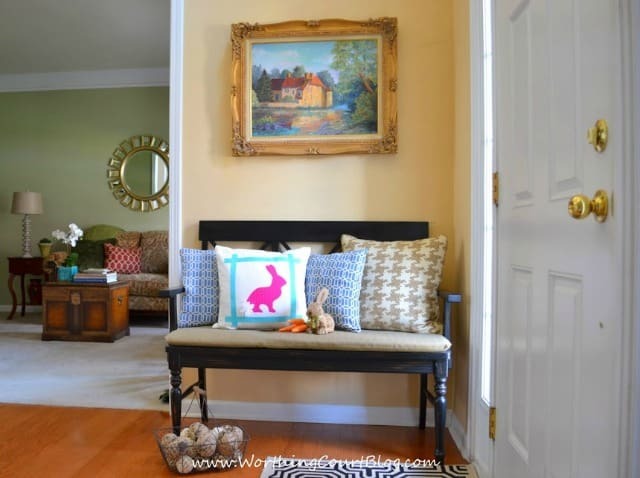 Enjoy this Easter project for the foyer of our previous home. We’re currently remodeling a new-to-us home. Click HERE to see how I’m totally changing my decorating style! 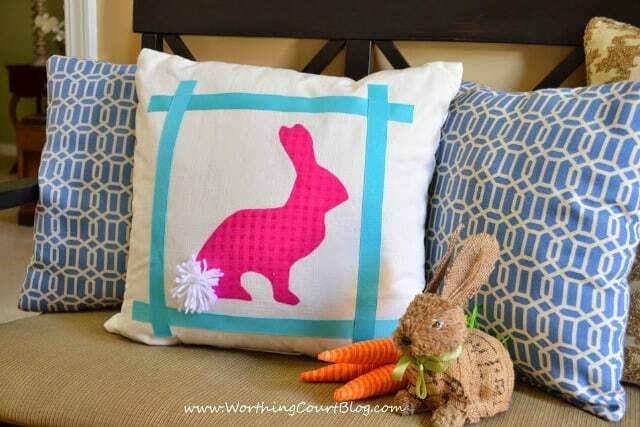 When looking for an Easter idea, I’m sure you’ve seen bunny silhouette pillows before. Perhaps, you’ve even seen no-sew versions. 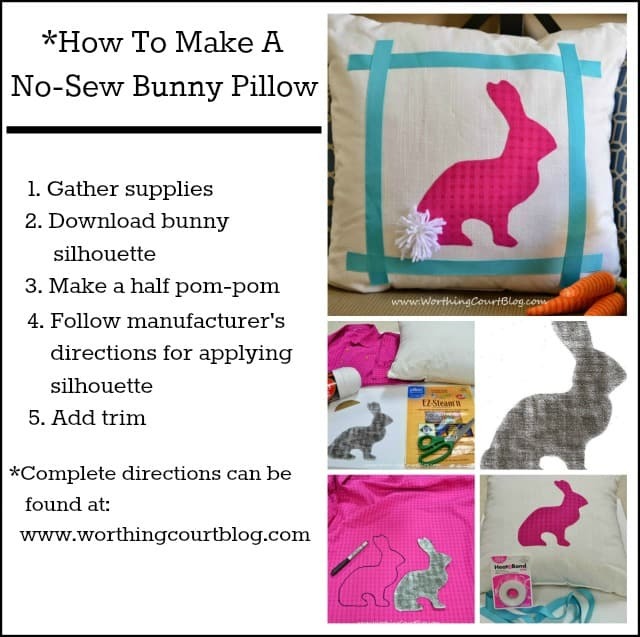 I’m here to share how I made my no-sew bunny pillow with you, along with a downloadable bunny silhouette and directions for making a half pom-pom for the tail. Directions: 1. 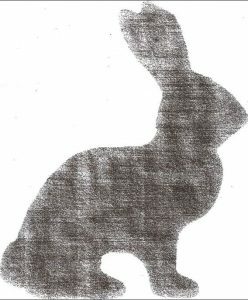 Download and print the bunny silhouette template. 2. After cutting out the silhouette, lay it on your shirt (or fabric) and trace around the edge of the silhouette. Cut the image out. 3. Follow the manufacturer’s directions on the fusible webbing for applying the fabric silhouette to your pillow. 4. 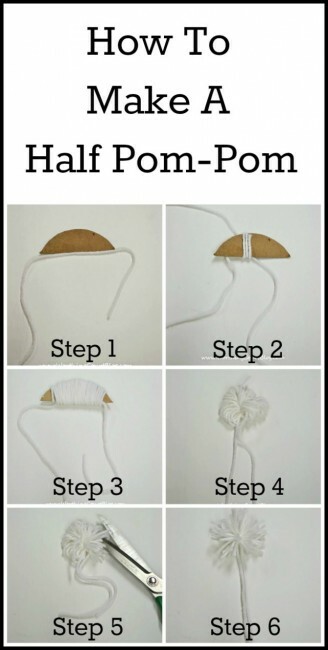 Make a half pom-pom. This picture is pretty self explanatory, I think. 5. 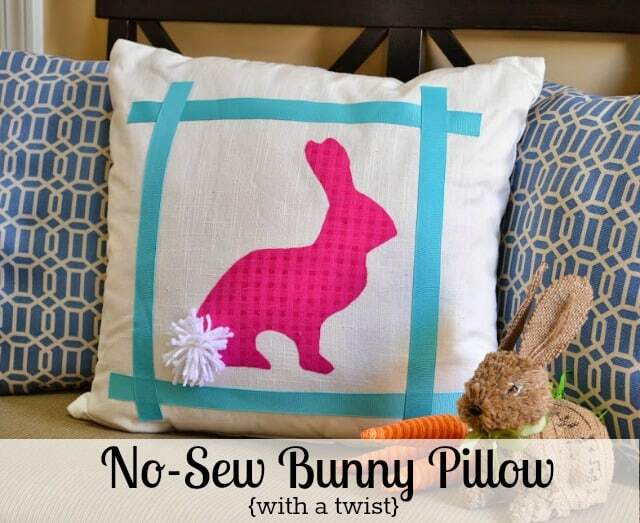 Follow the manufacturer’s directions on the hem tape to apply ribbon to the pillow. 6. Apply the pom-pom tail with a spot of hot glue. Not only did I repurpose an old shirt in making this pillow, I also am getting double the use out of a holiday pillow! Because of the evergreen branches on it, this pillow is normally put away after Christmas and winter are over with – taking up valuable storage space in my Christmas bins. 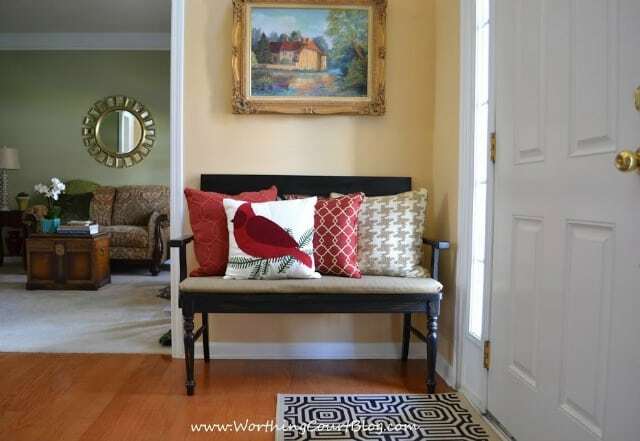 I love to keep special pillows on the bench in my foyer to greet my guests. Here’s how the bench looks through the winter. And here’s how it looks for Spring and Easter. 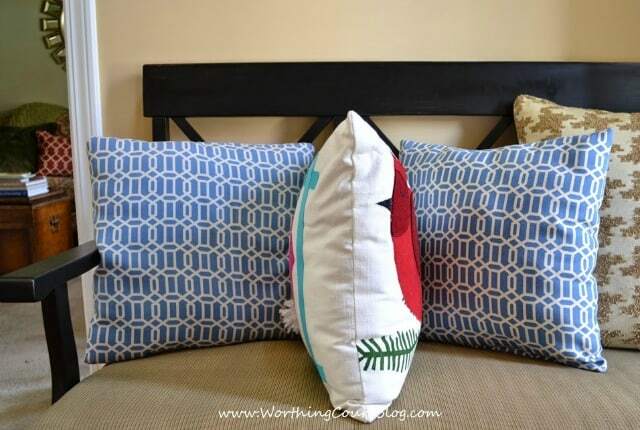 How about you – do you have special pillows that you like to use for each holiday? Suzy, your bunny pillow with the fluffy tail is so sweet! I never thought of looking for fabric from an old piece of clothing. I sure will now! What a brilliant idea! And I love the bunny’s little pom-pom tail!!! Don’t you love being part of this fun creative group? Well aren’t you a tricky one! Great idea and I love your cute little bunny. I also loved that shirt; I remember you wearing it many times. I can’t believe you cut it up! But I guess that bunny pillow was worth it. So glad to be of service, Sheila! lol Seriously though – I’m glad you like my pillow! That is the cutest and so clever to use both sides. Tim would love that since you know how he loves pillows! Ha! 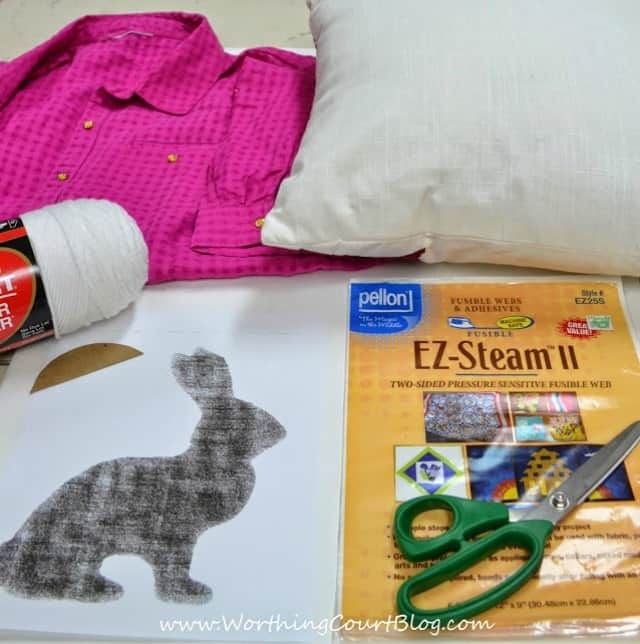 I enjoyed seeing how you made your bunny pillow and how you are getting the extra mileage out of one pillow. Thanks for the great tutorial! Love your pillow! I also really like that you were able to get two seasons out of one pillow. Very cute!